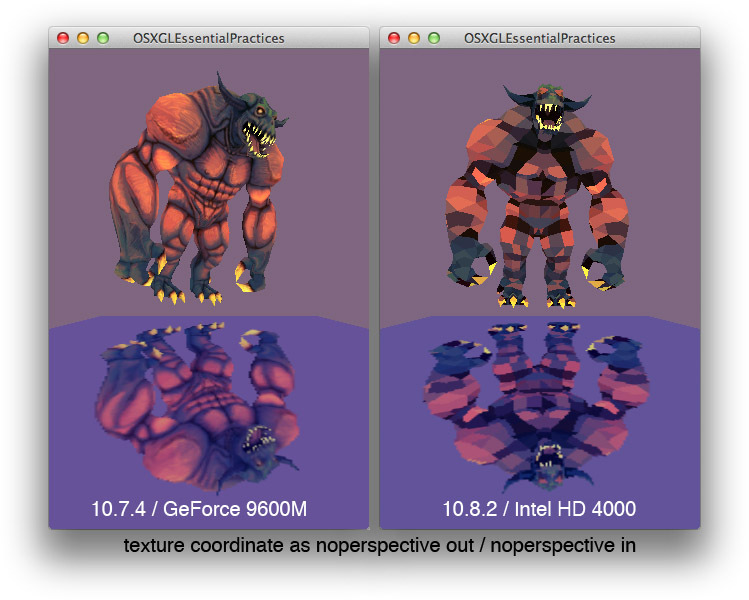 There seems to be a bug with noperspective varyings in OpenGL 3.2 contexts on MacOS X on Intel HD4000 hardware: The varying does not get interpolated and all fragments of the triangle get the same value (similar to flat interpolation). Note that in the left screen shot the image looks similar to perspective correct interpolated texture coordinates as the triangles are quite small in screen space but the are in fact interpolated non perspectively. As @marcofatto noted, the bug does not occur on his NVidia on 10.8, so it seems that the Intel drivers are causing the problems. The bug has been filed as #12728578 and joins my list of unfixed OpenGL bugs on MacOS 10.8. I think this bug has come back to life in the new MacBook Airs (with Intel HD 5000). I have developed a simple program that shows the same problems. Where can I download the demo from this post to do a double check? you can find some code based on an example from Apple here: http://files.renderingpipeline.com/macosxbug/noperspective.zip . Just switch the interpolation type in the shaders. On 10.9 with an HD4000 I can’t reproduce the problem any more.